Roberts Hawaii has become a staple of comfortable, reliable airport transfers, offering flexible service at a competitive price, with no more than five stops between your hotel and the airport. 24/7 availability and an incredible safety record are top reasons why you should think Roberts first the next time you need transfer service from Kona Airport. Getting around on the Big Island just got a whole lot easier. Instructions: Search for your hotel in the box below to find your pick-up zone. Please Note: If you are unable to find your hotel, feel free to contact us at 1-877-877-1222. Prices vary by area. Please check if your hotel requires additional fees. Please Note: $18 is the base price for guests staying in the Kailua-Kona area. Additional costs vary for other areas. Upon retrieving your luggage, look for a Roberts Hawaii staff member wearing a yellow aloha shirt. If you are unable to find a staff member, stop by the Roberts Hawaii kiosk. You can also call Roberts Hawaii's Kona Dispatch at (808) 329-1688. If you are having difficulty retrieving your luggage, please let the shuttle company know as soon as possible. or you may miss your ride. Missed shuttle services are non-refundable. 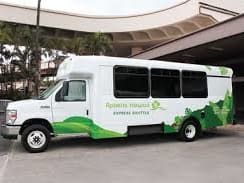 Look for a Roberts Hawaii shuttle or call Kona Dispatch at 1-808-329-1688. Wheel Chair Accessibility: Persons requiring a wheelchair accessible vehicle must provide the wheelchair type (electric is limited to 500 lbs, folding, etc.) in when booking. Due to limited availability, ADA (Americans with Disabilities Act) vehicle reservations must be made a minimum of 14 days prior to service date. Flight information and accommodation information is REQUIRED to make a booking. If they are not provided, your booking will be declined. How do I know which area to book for? Prices vary depending on the area. Please be sure to select the correct area associated with your hotel during the booking process. If you are unable to find your hotel, feel free to contact us at 1-877-877-1222. Shuttle rates include two (2) pieces of standard size luggage plus one (1) personal carry-on. One (1) piece of standard size luggage may be substituted for a golf bag. Please request if needed during check-out.